Driver Trevor Bale with a South East Petroleum R620 Scania truck. The Scania R620 rumbles north to provide some much-needed harvest fuel. Farm deliveries are a large part of the work, especially during harvest and seeding time. The company operates single trailer, double road train and C-train combinations, all of which are pulled by Scania prime movers. KEEPING the wheels of agriculture and industry turning can be a challenge in regional Australia. The tyranny of distance and a changeable climate makes for a big job description. 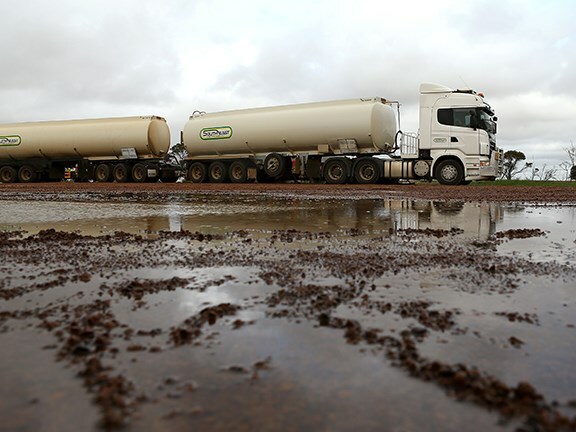 Esperance-based South East Petroleum on the south coast of Western Australia is tasked with keeping the fuel flowing to the southern wheat belt’s farmers and industry. It’s an isolated and sparsely populated area that clings to the granite, sand, scrub and clay of the Esperance Plains sandwiched between the Southern Ocean and the goldfields to the North. The Port of Esperance is the area’s gateway to the world. Fifty percent of Australia’s wheat crop is grown in WA and more than 95 percent of that harvest is exported to foreign markets, with some of it passing through this port. Yet this southern-most tip of the West Australian wheat belt is still something of a remote outpost. South East Petroleum is the local BP distributor. 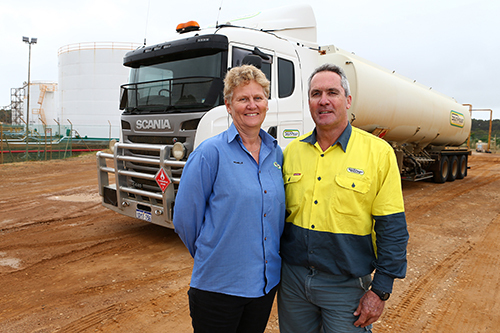 The business has been owned and operated by Grant and Michelle Harris since 1990 and handles fuel deliveries to farms, businesses, worksites and servos around the Esperance region. SEP also supplies service stations along the Nullarbor plain as far as Cocklebiddy. And, somewhat surprisingly for this region, the entire six-truck fleet consists of Scania prime movers. Grant Harris comes from a family farming background and the company workload tends to roll with the fluctuations of the agricultural seasons against the backdrop of consistent retail and industrial work. Seeding and harvest times see the SEP trucks busy keeping up with farm deliveries as well as maintaining the flow of fuel to retail outlets and some BP corporate customers. Grant and Michelle Harris have owned and operated South East Petroleum since 1990. As you’d expect of a country fuel distributor, South East Petroleum delivers ULP and PULP, but the rural and industry focus of the business sees diesel as the most in-demand product, Grant says, adding, "Diesel would be a good 90 percent of our business". Grant says that changing farming methods over the last couple of decades have had an interesting effect on fuel demand during peak times. "During seeding farmers are using bigger machines, but proportionally less fuel per hectare," he says. "But come harvest, when the weather comes right it’s frantic. They’ve got three headers, a chaser bin and two trucks … they use a lot more fuel over harvest than they used to. According to Grant, there are many innovative farming businesses in the area. "There are a lot of early innovators down here," he says. "They’ve set up the South Eastern Premium Wheat Growers Association (SEPGA), to run their own trials, raise their own funds and get their own corporate sponsorship. "As an area, there’s a group of really highly progressive and innovative farmers." One South East Petroleum employee is Trevor Bale, who drives one of the company trucks. Trevor works part time for the company as a relief driver as well as running his own business. I took the opportunity to go for a run with him in a Scania R620 truck hooked up to a set of double road train tankers. Given the variety of customers, the fleet uses a mix of B-double, road train, C-train and single-trailer combinations. Trevor has worked for SEP for over five years and fuel haulage is nothing new to him — years ago he cut his teeth with a 12-year stint hauling triples up north with Shell. As a double road train we were carrying 72,000 litres of diesel and Trevor’s day was going to consist mainly of farm deliveries. Nicely insulated inside the R-series cab, we idled out of town with the big V8 quietly rumbling under our feet. In typically Scania fashion the 16 litre didn’t raise much of a sweat as we climbed away from the coast; the Opticruise Automated gearbox quietly grabbed the required cogs. Two other R620s haul road train and C-train combinations. One is driven by 30-year company veteran, Glenn (Bindi) Sievewright, who looks after the two-day Nullabour run once a week, and the other is driven by Mick Creedon. All of the SEP trucks are on a Scania Repair and Maintenance (R&M) agreement and the trucks are serviced at the local Scania agent every 15,000km. The trailers are serviced every 7,000km. Because the fleet transports dangerous goods, the trucks and trailers are required to have an independent safety inspection every six months. As a mechanic by trade and wearing his maintenance hat, Trevor says, "The fixed cost factor (of the R&M agreement) makes sense for us. It helps us understand our cost base." And to date he’s pretty keen to sing the praises of Scania and the local workshop, saying they’ve been well looked after. The changeable weather that blows in off the Southern Ocean had brought a brisk wind and showers inland, slowing the frantic pace of harvest. As we drove, behind us the rear trailer and dolly rolled through a cloud road spray as Trevor and I chatted, his hands relaxed on the wheel. A C-train climbs out of Esperance. 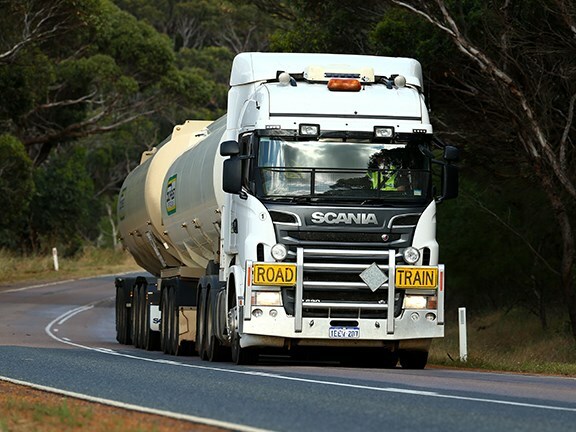 South East Petroleum also delivers fuel to remote service stations along the Nullarbor. 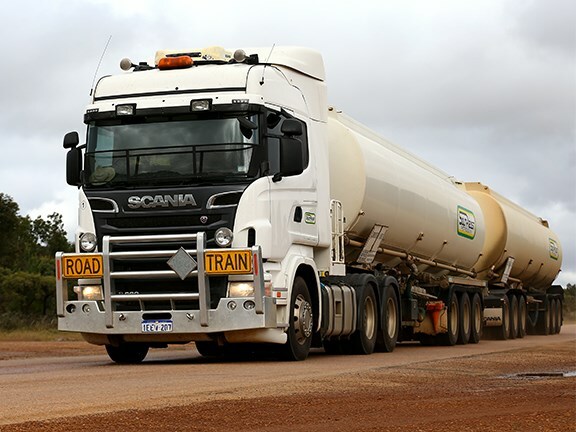 The South East Petroleum fleet works on a single-shift, one-truck, one-driver basis. As so much of the work is farm based there’s no real call for around-the-clock deliveries. No doubt not too many customers want to be woken in the middle night by a road train idling past the house. Our destination on this trip was the main property of Chillwell, which is run by the Fowler family. The Fowlers run 28,000ha, 18,500ha of which is used for cropping. Like many family farms in the area, Chillwell is only a second-generation business. Much of the area was virgin scrub until the first generation moved into the area. It was said that the area couldn’t be cropped. But, in keeping with Grant Harris’s earlier observations on innovative farmers in the area, the Fowlers have a no-till approach to cropping. The Fowlers have also come to the attention of others in the industry for the practice of using sprouting crop as pasture. You can imagine that a property of this size, with multiple headers working flat-chat at harvest, has a mighty thirst for diesel. Hence the 100,000 litres of storage on the farm, as well as a farm-based fuel tanker. The machines have gotten bigger too: headers with 50-foot combs are common place in this area and 80-foot seeders are just as common. 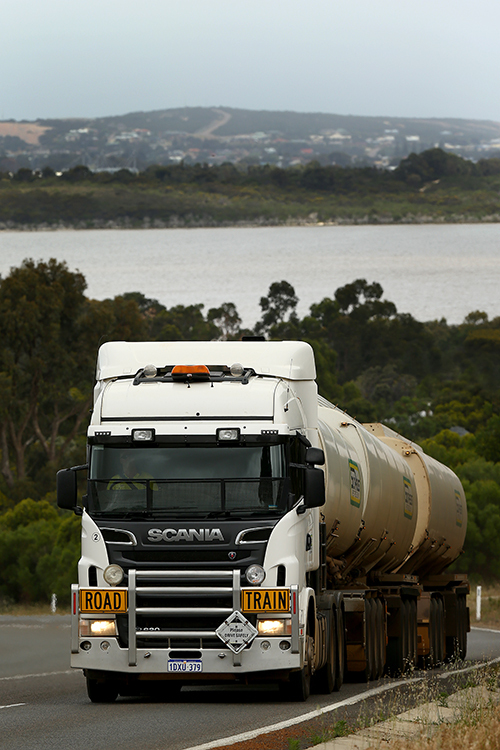 Farmers run their own road train combinations and feed their seeders with tippers. They’re big machines for big country. According to Trevor, this increase in mechanisation has seen harvest go from three months to just six weeks in many cases. And this harvest was looking to be a record year with many reporting yields of 4 tonnes to the hectare. Trevor’s Scania R620 grumbled along the rough blacktop smoothly. All of the trailers in the fleet are fitted with lift axles — as the compartments are emptied axles lift off the ground, improving manoeuvrability and fuel economy on the empty run home. The big Scania slowed to a crawl, with the retarder reducing the need for braking as we described a slow arc into the property. The rain had stilled the headers for a bit, but the property was still a hive of activity as maintenance was done, making the most of the spell before jumping back into harvest fever. 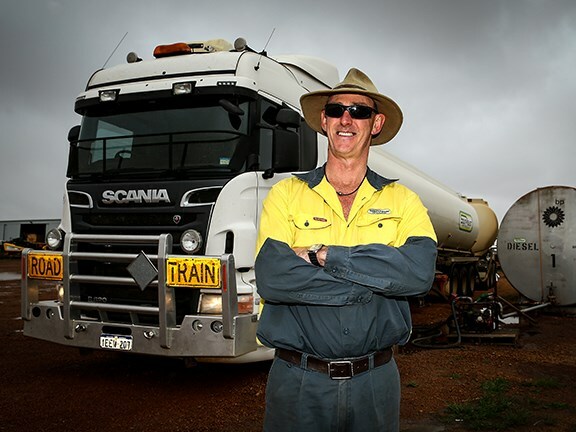 The sand and clay soil crunched quietly under the wheels of the tanker as Trevor expertly threaded the road train through the property gates and pulled to a stop alongside the fuel storage tanks. The heady post-rain smell of the damp earth hung in the air as if the pores of the landscape had opened to breathe. I shook hands with Trevor and said my goodbyes. The big Swedish V8 looks to be serving South East Petroleum well. In a role that would normally be associated with big American iron the Scania has been making friends of drivers and operators alike. And the wheels of the rural economy will keep on turning. A couple of weeks after our visit to Esperance disaster struck. Lightning strikes and high winds sparked a blaze between Scadden and Salmon Gums about 100km north of Esperance. One local died while trying to warn his neighbours to evacuate and three farm workers died fleeing the blaze. Farms and crops were completely burnt out. Over 300,000 hectares were completely burnt out, obliterating a harvest that for some was set to be the best ever.